This is not a true holiday dish but it does grace my dinner table at least once over the holidays. Guaranteed. You see, I have a “thing” for turkey sandwiches and you might be surprised at the lengths I’ll go to make sure that I have turkey sandwiches every Thanksgiving. As an adult, the highlight of my Thanksgiving Day Feast has always been the midnight turkey sandwich. Built with slices of turkey (white & dark meat, of course), a healthy portion of stuffing, and cemented together with cranberry sauce, this is the “sammich” of which my dreams are made. No matter what I’m eating throughout that day, I never lose sight of that night’s prize. Now, when I host the dinner, having enough turkey to make a sammich is no problem. In fact, I buy a bird twice as large as needed so that every guest goes home with a platter of leftovers. Each then can either relive the dinner — sans my buoyant personality, of course — or make at least 2 healthy sammiches. And I will have at least enough turkey for a few sammiches, as well as a good-sized portion destined for the freezer for sammiches to be built at a later date. That’s if I host the dinner. Things can go quite differently, however, if I’m enjoying Thanksgiving dinner away from home. Over the years, I’ve been invited to some lovely Thanksgiving feasts where the company was warm, the dinner fantastic, and the wine flowed freely. I could say the very same thing about those occasions where friends and I gathered at a restaurant for dinner. Both situations allow me to relax and enjoy my friends and the meal without the stress of having to juggle 6 side dishes on a 5 burner stove top; remember that there are bruschette under the broiler; and keep an eye on Max who’s been keeping his eyes on the tented bird on the counter. Both options sound wonderful except for one little detail. There are no leftovers and without them there can be no sammich. Oh, the pain! After going sammich-less for a couple of years, I’d had enough. (Well, actually, I’d had nothing.) I decided to roast my own turkey, no matter what, sometime during Thanksgiving week. Granted, when the bird is meant for me alone, I look for the smallest, fresh turkey available, usually 9 to 10 lbs. That’s less than half the size of the behemoth that I prepare when I’m hosting. Even so, I get all the sammiches I want, half of the bird gets wrapped and frozen for another time, and I still have the carcass to play with. Ah, the carcass! When I remove the meat from its bones, I make sure to leave some behind. Then, when it’s time to prepare the stock, I find and retrieve those bits. As you’ll soon see, they, along with the stock, will be used in my risotto. It really is a nice arrangement. I have a turkey dinner — maybe two! — I enjoy plenty of sammiches, and I have turkey stock to make my “holiday” risotto. When you read today’s recipe, it may be that I prepare risotto differently than you do — and that’s ok. If you’ve a proven method for making risotto, don’t change for this recipe. The important thing about this risotto is not how it’s made but what is used to make it. In this recipe, turkey stock is used in place of chicken, and, chopped turkey is used instead of any other type of protein or even mushrooms. I don’t want anything to mask the flavors of roast turkey and, if the bird was stuffed, the hint of stuffing. Add butter to a large pan over med-high heat. Add onion and sauté until translucent. Add turkey to the pan and continue to sauté until heated through. Lower the heat to medium, add the rice to the pan, and toast the grains, about 5 minutes. Add the wine and stir. Continue to cook until the wine is all but evaporated. Ladle by ladle, add the turkey stock, stirring with each addition and allowing the stock to be fully absorbed before adding another ladle of stock. Taste the rice for doneness after about 20 minutes. It should be nearing completion. When the rice is al dente and just shy of being done, add another ladle of stock, cover, and turn off the heat. Allow to rest for 5 minutes before adding 2 handfuls of Pecorino Romano cheese. Garnish with more Pecorino Romano cheese and serve. In a large stock pot over med-high heat, add the roast turkey carcass, a large onion (quartered), 2 celery stalks with leaves (roughly chopped), 2 carrots (roughly chopped), a few parsley sprigs, and enough water to cover – about 5 or 6 quarts. Bring to a boil before reducing the heat to maintain a soft simmer. I let the stock simmer for at least 3 hours, adding water if too much evaporates. The object is to have at least 2 quarts (2 L) of stock when all is said and done. When finished, strain stock through a fine strainer. Refrigerate stock overnight and then remove any fat that may have risen to the surface. Stock is now ready to use in your favorite recipe or to drink, warm, by the cupful. When making risotto, I use a ratio of 3:1. That’s 3 parts stock to every 1 part of rice. I usually have an extra cup of stock ready but, if I run out, I’ll add some hot water. Bear in mind, that I’m only using a little water, certainly not even a cupful. You may think it odd that I used 1 3/4 cups of rice but that’s because it was the end of the package’s contents. I didn’t see the point of reserving a quarter cup of rice. So, use as much rice as you like but keep the above ratio in mind. Do keep the stock hot, but not boiling, when adding it to the pan of cooking rice. Boiling stock will hit the hot pan and evaporate before it can be absorbed by the rice. On the other hand, if it is too cool, it will delay the cooking process. We prefer our risotto to be on the moist side. 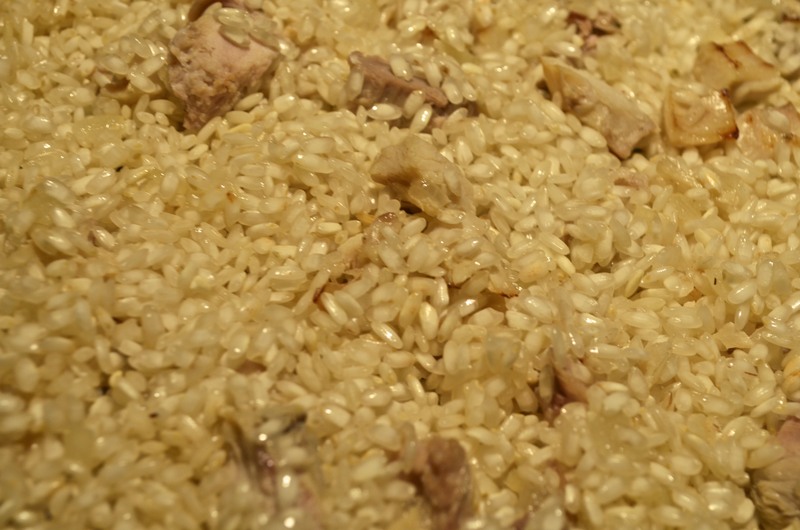 You’ll find that the rice will continue to absorb the stock even as it sits in the serving platter. Just as surely as you’d find a platter of ravioli on our Christmas dinner table, you could count on there being a platter of biscotti on that very same table, served after dessert while the castagne, chestnuts, were being roasted. Both recipes that I shared came to my family about 50 years ago. Mom’s Biscotti with Pecans, was a family recipe of a friend who was 90 years young at the time. We know that recipe is at least 100 years old. Zia found her recipe for Anisette Biscotti in a local newspaper. Both are simple recipes and are as traditional to our holidays as is that Christmas tree in the corner waiting for the Feast of the Epiphany (Little Christmas). You can find both recipes by clicking HERE. This entry was posted in Family Recipes, Gluten-Free, Pasta/Rice/Soups (Primi Piatti) and tagged Cooking, family recipes, Food, Italian, Recipes, Rice, Turkey by ChgoJohn. Bookmark the permalink. Delicious! I have made chicken risotto with leftover chicken, so why not turkey risotto with leftover Thanksgiving turkey? I am sure my mom would love this, I will tell her so she knows what to make with all those leftovers. Though I am sure that she will first have to cut up some of the meat for my dad’s sandwiches! Like you, he couldn’t stand the idea of Thanksgiving without leftover sandwiches! Great minds think alike, Darya, and I can tell your Father is a great man. 🙂 I hope your Mom does try and enjoys this risotto. Thank you for stopping by and for taking the time to comment. I love the idea of turkey risotto! Such a great way to use up leftover turkey meat, which we always have after Thanksgiving. Would you frown upon me if I used ground turkey as a substitute during off Thanksgiving season? It sounds amazing John. Thanks, Anne. You know, I’ve never thought to use ground turkey but it would be a great way to have turkey risotto year-round. Good idea! I really Like you r creativity,great combination with the turkey,it must be very delicious. Thank you, Massi, for the nice compliment. Yes, this is a good tasting risotto. The roast turkey flavor is unlike most risottos I’ve ever tried. Funny how the main course is really just a jolly means to a longed for end! What we’ll do to satisfy our cravings, eh? Loved your post, John, and am grateful for the 3:1 reminder – the last couple of risottos I made were disappointing because I didn’t allow for post-cooking absorption. Sounds wonderful, never thought to have turkey with risotto! I hope you try it. Thanks for commenting. I’m not a massive fan of turkey … but I do like a turkey sandwich – just as you like yours, by the sound of it! Aren’t they the best? THey certainly are a highpoint of my Fall. I hope you have a wonderful Christmas, too, Marianne. Great words John. I can’t get involved as I really am not a big turkey fan. I do understand the sandwich cravings. I have similar at this time of year for plain white bread, English mustard and rare beef. Thankfully, we are having a 4 rib roast beef for Christmas dinner. 5 will be sitting down so plenty for “sammiches”. Thanks, Conor. I do love a good beef sandwich, too. In fact, New Year’s Day I’ll be preparing a rib roast, too. What better way to start off a new year than with an ample supply of roast beef sammiches? It works for me! This both looks very tasty (and I got very hungry…), and is a clever way of using the ingredients to the maximum! The true Italian style: don’t waste anything! I’ve not thought of turkey risotto….sounds delicious. I was just thinking about risotto John, what a coincidence! And as luck (or good planning on my part) would have it, JT and I are hosting Christmas Day dinner at our home, so we will have Christmas turkey this year (we haven’t hosted in years for a number of boring reasons). I love how you prepare your stock, in fact it’s the identical way I’ve been preparing chicken stock of late. The pre-roasted carcass brings a wonderful flavour to the stock. It’s so nice that you buy a bird much larger than needed to give away left overs, that us so very generous of you, but it doesn’t surprise me; your friends are indeed very fortunate to have you. You have inadvertently caused me a quandary; I was gifted a jar of roasted chestnuts from a photo shoot and I had every intention to make a stuffing for our bird from it, but that biscotti recipe sure sounds amazing and it’s really making me want to change from my intended use. Oh the decisions. The pasta dish looks fantastic and even though it’s only 6am, I’m licking my lips. Thank yo so much, Eva. You’re always so supportive and generous in your comments. Do you stuff your turkey? I no longer do but, I must admit, stock made from the carcass of a bird that was stuffed is just incredible. That stock makes the best risotto, too. Using chestnuts in stuffing is how Mom made her stuffing. I had intended to do it this year but I forgot about them roasting in the oven. When I finally remembered, they were a bit too “crunchy” for stuffing. Hi John, no we do not stuff the turkey any more, our health department suggests it is unwise to do so (although my dear Mother used to and we never fell ill!). Same here, Eva, and my Mom stuffed her birds every time. It’s a shame because that made the very best stock. I enjoyed a very nice Christmas and hope you can say the same. Here’s wishing 2014 is a good year for us all. I use the carcass with meat on it for everything from soup to well, risotto. This looks yummy. Haven’t made risotto in a long time. Will try it after Christmas. I’m not going to say the sammich idea was stolen. Rather, all great minds think alike. I’ll make myself one of these sammiches anytime I’m feeling hungry over the few days following Thanksgiving. I never tire of them. As for pizza, I always make sure there’s one piece left for breakfast the following morning. Who needs granola when there’s a slice available? I love the detailed stories you tell with your recipes. They make your posts priceless and enjoyable as well as informative to read. Love turkey sandwich as well. I had no idea anyone else liked. the dressing cemented sammich, a guilty pleasure of mine for decades mmmmm! Thank you for the recipes especially the turkey stock. Somehow I always mess it up so am looking forward to following this and making the risotto.! Hello, Chris. To be honest, I’m a little surprised just how many people love this sandwich. Then again, what’s not to love? I always run out of turkey before I tire of the sandwiches. Although I now cook the dressing outside of the bird, the best turkey stock comes from a carcass that’s been stuffed. The bits of stuffing left in the bird really do flavor the stock. That risotto, as you can imagine, is really good, too. I hope both your stock and risotto are to your liking. Good luck! We very well might be related, Sue. I think of the turkey as a means to an end. The end being days of delicious turkey sammiches. I hope that you and your family will share a beautiful Christmas, Sue. Thanks, Tanya. I, too, wondered about goose risotto when Mad Dog mentioned he was roasting a goose for Christmas. I bet that it would be wonderful! I really do think that the leftovers are better than the meal. I do love my sammiches! No big feat here for Christmas Eve, though I’m soaking a piece of baccalà. That will be plenty for me. Enjoy your seafood extravaganza, Tanya, and may you, Big Man, and your family have a wonderful Christmas! I completely agree, John! NEED to have the sammich (or two, or three). But that risotto looks VERY fine as well. I’m hoping to get to baking my biscotti tonight (a less traditional recipe to be sure, but easy to make and the ‘absolute favourite’ of one of my friends). There’s no sandwich like a turkey sammich! I’m glad that you agree. 🙂 The beauty of this risotto is that you can make it with just the meat you pick off the bones. No ned to use the precious sammich meat. Traditional or not, if your biscotti are good enough to be considered a favorite, those are the ones to be made for Christmas. I hope your friend enjoyed them.. Happy Holidays to you and yours! your risotto is perfect, I like the way you allowed the turkey to shine and nothing else…. Thanks, Mar. Glad to read that I’m not the only one that will eat risotto on a wintry morning. Congratulations to your Son. What a big day for him and your family! I hope your travels were safe without any complications or delays. You’ve a graduation to attend! I didn’t think I liked risotto until trying your chicken-gizzard recipe. Yum! Freezes well! Still yum! WOW – WOW & WOW !!!!!! I love each and every recipe – and – I can’t wait to see the one for the seafood cooked in parchment. 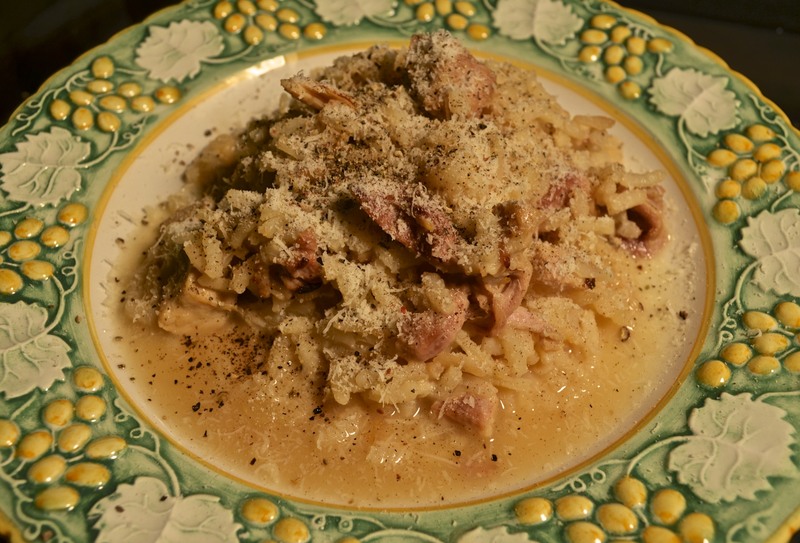 I simply adore risotto – and adding some leftover turkey is such a great idea!! I, too, am crazy about turkey sandwiches!! John, I just love how your fabulously fun personality comes across in each & every one of your posts!! You are indeed a kindred spirit…the sammich is the whole point of cooking a huge Thanksgiving or Christmas turkey! We usually use leftover turkey (after the sammich portion is taken care of) for making Turkey Tetrazzini; I started this tradition years ago after looking through a cookbook for recipes and ideas for leftover turkey. I will have to try your risotto…it looks delicious! Thanks, Angeline,. For me, the beauty of this dish is that it is made from scraps. The meat is the last bits to come off of the carcass before it is used to make stock. It doesn’t cut into my sammich meat and won’t affect your tetrazzini, either. It does give you another option, though, for the days following the holiday. I hope you and your family enjoy a very Merry Christmas, Angeline. I’ve made a chicken risotto, but not a turkey one – I gotta try this! Such a good idea. I’m with you on leftovers being the best part of Thanksgiving (or Christmas – we repeat our Thanksgiving meal for Christmas, although with fewer sides). On those occasions when we enjoy Thanksgiving away from home, a day or two later we always prepare “Second Thanksgiving” – that’s right, we redo the entire meal, often just for the two of us. That we we get to cook our favorite meal of the year, and we have all the leftovers we can handle. 😉 Fun post – thanks. You know exactly what I mean then, John. Nice a it is to eat out, the leftovers are a big part of my holiday dinners. It just ain’t right without them. If you make chicken risotto, then this will be a snap for you. I hope the Holidays are fantastic for you and all the Riffs, John. Ah, you build the exact same turkey sandwich that I do – got to smoosh that stuffing & cranberry sauce in there. My husband believe it or not puts just slices of white meat on bread – wha??? Anyway, I didn’t have any this year because I was sent home with what I figured was a bag of salmonella (my SIL let the turkey sit on the counter for 6 hours & we had a 2 hr. ride home) so I decided that gracious gift was going in the trash unfortunately. You’ve found the perfect solution & with all that you get from a little bird, you’re set for a while. I hope Max gets at least some of the bounty. Although I’ve used a touch of white wine at the end, I’m leery of it. If I use too much, it can overpower the flavors of the risotto. I rarely need any liquid, though. I try to have at least an extra cup of stock heated up an ready to go. Happy Holidays Diane, to you and yours! Excellent point on the proper sammich makings John. I think you’re right – I’ll just let him eat his dry ol’ white meat. Have an exceptional Christmas & terrific New Year. Thanks, Francesca. I’m sure you’re correct. If turkey was more prevalent in Italy, I’m quite certain that turkey risotto would be common. Buon Natale! Every year, I say that I should roast a turkey “off-season” some time. I never do and it’s foolish. I really enjoy turkey and, well, those sammiches! Oh, the sammiches! I do hope you’ll try and enjoy them, Debra. I hope your holidays are most memorable. it would have never occurred to me making risotto out of a leftover turkey carcass, this is great! I might need to roast another turkey, just so I have no excuse and make this. Those turkey sandwiches you describe …. I just had lunch and Im hungry again! Paul, once you go sammich, you’ll never go back to a plain turkey sandwich again. They’re life changing. I roast my own turkey just to make sure that I can have some during the holidays, for heaven’s sake. This risotto is no harder to make than any other and it’s a great change of pace. If you try it, I hope you’ll like it as much as we do. Sounds wonderful John. A big bowl of warmth, and comfort. Exactly, Dave! It’s perfect for the cold days ahead. I am a fan of risotto. This is such comfort food for me and when the weather gets cold, I crave this! I am looking forward to your Linguine with Seafood in Parchment! Thank you for the recipes! I’m with you, as far as risotto goes. It’s a great meal for a wintry night. THe seafood pasta recipe will be posted in a few hours. I hope you’ll enjoy it. Thank you for the visit and for taking the time to leave a comment. Happy Holidays! How exciting. Can’t wait! 😀 Happy New Year! Thanks, Kristy. I’ve not seen a recipe anywhere for turkey risotto, either bu, for me, it’s a no brainer. It’s basically made with turkey scraps so my precious supply of sammich meat remains untouched. And it’s tasty, to boot! I’m honored, Kristy that you’d cook one of our recipes — again!!! — on Christmas Eve. I consider it a compliment – and vote of confidence – when someone tries one of our recipes. It’s something else completely, though, when a recipe is chosen for so special a meal. Zia will be thrilled when I tell her. Thank you so much. I hope you, Mike, and your talented Sous Chefs have a wonderful Christmas.! Yum. I love that you cook a turkey for personal dining even if you’ve eaten out. Yep, me too. Because I am such a slave to traditons I’m fond of, they’re not the same without the right food. We haven’t had a turkey for a couple of years but when we did we made our sammichs the same as we do with roast chook… fresh white bread, creamy potato salad and stuffing. As we are out and about on Christmas day often, sometimes we have this for lunch and then enjoy a proper dinner later in the cool of the evening. The G.O. doesn’t eat rice, but I can make similar with risoni… mmmm. Thanks, EllaDee. We’re very much alike when it comes to traditional foods and holidays. That turkey sammich at midnight is as much a part of my Thanksgiving as is anything else. I do like your idea of including creamy potato salad in your sammich. I need to give this a try. I may like my tradition but I’m not tied to it. I can change. How delicious! I love risotto too and this sounds great. We didn’t host this year so I was bummed not to have some of my favorite leftovers. We had sandwiches for a couple days, but I really would have liked to cook something. Last year it was turkey tortilla soup and a turkey and wild rice soup. Have you blogged your turkey tortilla soup recipe? It sounds really good! I haven’t blogged the soup. It was just something I threw together. I will be working on more soups soon though. Tis the season for soups, even here in the South! I feel like a disadvantaged child 😉 ! Since we lack Thanksgiving and I have never cooked a turkey for Christmas . . . BUT, turkey pieces have become hugely popular in Oz, including packets of largish legs, usually sold as twins. . . . roast a tad more than you need for the table and do enjoy these awesome sammiches which so make your life 🙂 ! Oh, am looking forwards to your next recipe also, once you have slept off the Christmas Day wonders 😀 !! Now that’s an original recipe! Turkey risotto looks just great. I will definitely make it next time I roast a turkey. Dare I admit to the fact that I still have a smoked turkey carcass in the bottom of my fridge? Left from Thanksgiving? How long do those things last? Doesn’t smoking make things last longer? In any case, if I dare… this sounds so good. Perchance, manservant will smoke another and I can have smoked turkey risotto. After all it is just the two of us for Xmas Day. Unless we decide to go out for Chinese! I must be the only person on Earth who doesn’t fancy turkey! I love all the sides and the leftovers, I just eat those and make sammiches for everyone else 🙂 I however, adore risotto and have shamelessly made myself a pressure cooker version when craving has struck. Your risotto looks lovely though, and I can imagine how flavourful it is with the turkey pieces cooked in it from the beginning and all that flavourful stock. I’ve never thought of making turkey risotto, I make chicken risotto all the time but next time I will definitely have to remember the turkey version. I hope you’ve had your fill of turkey sandwiches, btw, your sandwich sounds quite delicious, anything with stuffing is pretty yum. 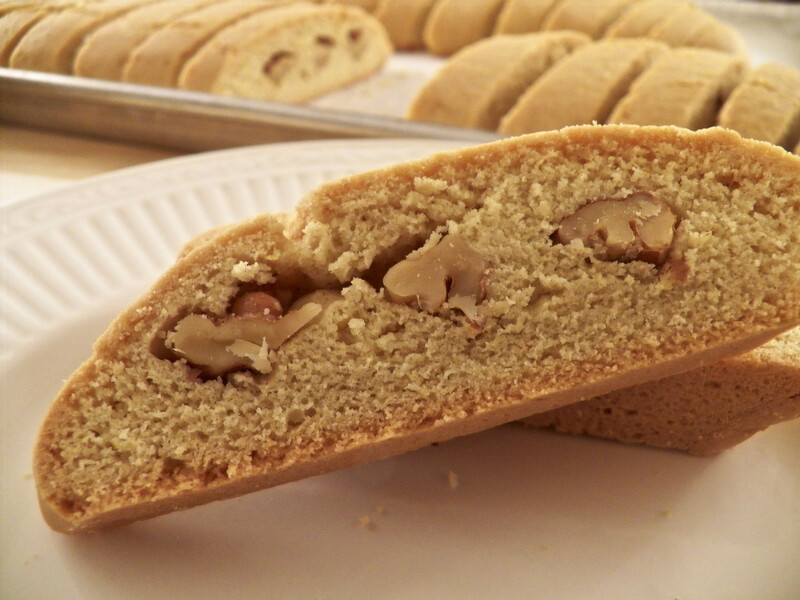 And that biscotti….mmmmmm. Thank you, Nazneen. I hope your family appreciates you, making a turkey and sammiches when you do not like it. If you make chicken risotto, you’d have no problem making this one with turkey — once you get beyond your aversion to the bird. The stock does give the risotto a nice flavor, though, even better if your stuffed the bird, Those little bits of stuffing in the bird’s cavity add a nice taste to the stock and subsequent risotto. Thanks for commenting, Nazneen. I’m glad that you liked today’s post. Oooh I love a good poultry risotto! But the ‘sammich’ sounds gorgeous too 🙂 Bring on Christmas day and all the leftovers! is it wrong that I laughed at ‘and I still have the carcass to play with’? 😉 Great recipe John! Love this recipe – but not sure if I can tackle risotto again – although your method seemed to go quite faster than mine. Thank you. If you’ve a recipe for risotto that ‘works”, I’d stick with it. Just use turkey stock and turkey meat. Even so, you’ve 3 restaurant critics to contend with. Turkey risotto recipes can wait a while. I bet those 3 are pretty excited, eh? They’ve got a couple really great days ahead. What fun? I hope you all have the best Christmas ever! Those are my thoughts exactly, Judy. The turkey, to me, is worth more leftover. The turkey stock is essential to this risotto. It really does flavor the rice very well. I hope you and your loved ones have a very Merry Christmas, Judy. You sure do love your turkey John. That is a beautiful looking risotto. I love risotto so much, I will eat it in any flavourful variety I can get my hands on! And what a genius idea. We all have turkey leftover, no? I have to say, I like turkey but I much prefer a turkey sandwich or turkey enchiladas. Probably this turkey risotto too! I guess what I’m trying to say is I would rather a “leftover” turkey dish than turkey itself. And the Epiphany… la Festa della Befana! That is why I love your storytelling John, you bring back such fond memories of growing up in an Italian household! Grazie! Guilty as charged, Lidia. I’m a turkey lover!!! 🙂 We are in total agreement, too. I much prefer the turkey leftovers — the sammiches!!!! — to the actual turkey dinner. Turkey enchiladas, by the way, sound wonderful. So many people have suggested some great recipes for the leftovers that I may have to make changes next year. I’m certainly not going to cut back on my sammiches, so, I’ll need a bigger bird. What a wonderful use for the carcass, John. I love it when nothing is wasted. Good on you. Even though an invite is not to be sneezed at, I do like to celebrate the big occasions at home. There is something special about being the host or hostess. “After going sammich-less for a couple of years, I’d had enough. (Well, actually, I’d had nothing. )” Hehe. I am glad that you took matters into your own hands! 🙂 This recipe looks delicious – and your midnight treat sounds like pure heaven. I like that you keep your eye on the prize: delicious! It sounds like you will have to continue to make sure you have a turkey sandwich at midnight – and keep spending Thanksgiving with good friends, too. This year, I sent all of my guests home with leftovers, including (of course!) white and dark meat turkey, apple-fennel stuffing and cranberry chutney. They could have certainly made a sandwich at midnight. Like you, we make a VERY large bird – or two. I enjoyed reading the anecdote, the recipe – and the pointers on risotto. I am still working up the courage to try it! This may be a sign. A very happy holidays to you! Thanks for sharing. Thank you so much, Shanna. You’re always so kind and supportive in your comments. I’m glad you enjoyed this post. My love of turkey sammiches knows no bounds. I know what it is like to be a guest for Thanksgiving dinner, only to be turkey-less come time for my midnight sammich. Never again! I think my methods are spreading, too. This year’s dinner was at a restaurant and a friend confessed that he, too, had a turkey at home. See? Converts! I wish you and your loving family warm and joyous holidays! I like risotto of all kinds, Celi, especially now, when the weather has turned cold. Turkey risotto is good but if you’re not partial to turkey, go with chicken instead. I’ve promised to make that soup for Zia when I visit her next. They may not have much in her area but they do have squash, plenty of squash. It’s another cold one. Keep warm! I love turkey sandwiches and the dishes made with leftover turkey. I think this risotto would be much, much better than my mom’s arroz con pollo. She always insists on making it every New Year (for good luck), but no one eats it but her! Thank you. It’s a great way to deal with the turkey leftovers. I too always buy a larger bird than needed for leftovers and the bones do not go to waste either. I would sometimes make broth other times I may make congee (Chinese rice soup). Is there a reason for listing the broth twice in the recipe? Your risotto sounds easy to make, need to give it a try. My last foray into risotto was not spectacular, but I really like this recipe. In fact, I’m trying it again, just like you’ve laid it out here. I mean, you cannot go wrong with turkey stock. I’ve read your notes carefully and I’m excited to try this again. I know this will be fantastic. Thank you, Ruth. Making risotto is no easy task. It took me several attempts to “get” it. Once you do, though, it’s like riding a bike. It will be smooth sailing no matter how often you make it. Good luck! Oh boy this looks good John! I adore a good leftovers recipe, and love the sound of turkey stock, which I’ve never made before. Your risotto sounds beautiful, with not too many ingredients – no doubt the turkey positively sings! 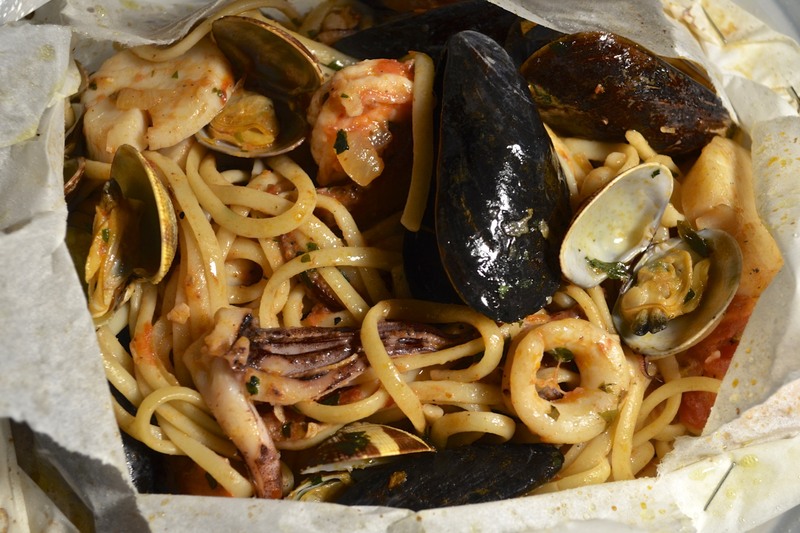 Very much looking forward to your Linguine with seafood in parchment recipe. I’ve never tried the pasta-in-paper technique. I do enjoy your regular taunting of us with photos of the next episode! The seafood pasta has been posted. Enjoy! Thank you, Celia. I won’t be doing any post-holiday turkey shopping this year. I’ve still got quite a bit of turkey in the freezer. When it’s gone, I know I’ll regret not buying one. One of this year’s highlights, Celia, has been getting to know you. It’s truly been a pleasure and I look forward to seeing what 2014 has in store for us. I hope your Christmas is the stuff of which warm memories are made. I always enjoy your posts so much! Your risotto looks wonderful and I could just taste it as I read about it. I just made a couple of liters of stock from moose bones and the little bits of meat. It had been freshly butchered and the “left-over” bones needed to be used. May you have a very Merry Christmas! Oh this looks all kinds of yummy! I love risotto! A perfect holiday treat! Wishing you and your family a wonderful, blessed Holiday. Thanks and may your Christmas not only blessed but also the most memorable one yet for you, your Wife, and awsome Son. I love the sammich of your dreams! That is awesome John, a true food lover! And I am just going come out and ask that I be asked to your next big gathering…I’ve never been to a dinner party where left overs were handed out like door prizes! You have some lucky friends! I had been waiting for this risotto recipe, it does NOT disappoint! Leftovers as door prizes! That’s good, Tanya. I just don’t want anyone to be hungry at mid-night and nothing in the house. I’ve been there and it’s not a good way to end Thanksgiving: hungry. Besides, when it comes to roasting a turkey, whether 10 or 24 pounds, the process is the same — but one does give you more sammiches!!!! I’m glad you like today’s recipe. I hope you do give it a try and like it as much as we do. Love this post John! Haha, as someone who doesn’t celebrate Thanksgiving, I find it interesting that the leftover turkey sammich is your fave part of the holiday feast! We don’t even eat a turkey at Christmas (Aussies often have seafood at the beach) so I’ve never had a fresh turkey sandwich (I have eaten one made out of pressed turkey meat from a delicatessen but that doesn’t really count). Love the sound of this risotto though, yum! Gorgeous homemade stock, glistening arborio rice, it sounds heavenly. I do hope that the Bartolini’s enjoy a beautiful Christmas and a blessed new year! Wishing you and all whom you hold dear a very Merry Christmas, Laura, with joy and good health in the New Year. You’ll always be welcome, Melanie. Thank you for your support and positive comments. I wish you a most memorable Christmas and a prosperous New Year! We do enjoy it, Liz. Give it a try. I bet you will, too! What a lovely risotto! A great way to use leftover holiday turkey! Thanks John! Delicious! I know I would have enjoyed it. I very rarely make turkey tetrazini nor many of the other casserole dishes with turkey leftovers. I do love my sammiches. This risotto gives me a delicious dish and doesn’t cut into my sammich meat. It’s a definite win-win! Wishing you and your loving family a most joyful and blessed New Year! How did I miss a whole two postings! I laughed when I read this post. Turkey only means one thing to me too – ‘sammiches’. For me it has to be on white bread, sliced turkey breast, stuffing and like you cranberry sauce. I also like the addition of a pickled onion on the side! We too have turkey risotto – cooked your way. My only addition is to add a handful of peas. I still have my eye on your quail egg recipe – cannot wait to try it. Thanks, Maria. It really has been something to learn just how many people love these sammiches. Then again, what’s not to love? And the great thing about this risotto is that you can prepare it without cutting into the supply of sammich meat. It’s a win-win! I like your idea of adding peas to the risotto. They’ll add a nice flavor without overpowering the turkey. Thanks for the tip!